Marcus Jidell (Sweden) has been a Box of Doom customer for some years. The Stockholm based guitarist is known for his work with Soen and Avatarium, but also know for his work with Evergrey, Royal Hunt, Pain and Candlemass. Recent album of Soen has been completely recorded with the Box of Doom, including all bass guitars. All leads on the latest Avatarium album were recorded in his home studio using his Box of Doom. After using the iso cab only for recording purposes, Marcus decided to take his isolation cabinet on tour. 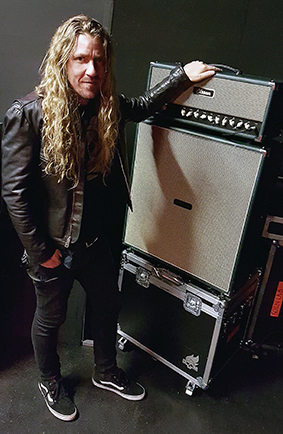 During the 2017 European tour with Soen, Marcus used the Box of Doom for the FoH signal, enabling the techician to work with a clean signal, without any noise bleed on stage. We are especially proud of the fact that Marcus also prefers the BoD on stage as in his studio. Marcus' set up is plain and simple. Please check out the new Soen album! and hear the Box of Doom on guitar and bassguitar!